Marie Marshall wishes us a ‘Cold, Undead Christmas’ here today, with news of her recently-published From My Cold, Undead Hand, and the as-yet-unreleased sequel KWIREBOY vs VAMPIRE. Categories: Agency | Tags: author, Book for sale, books, fantasy, fiction, news, novel, publishing, vampire, vampires, writing | Permalink. Cracking review for ‘From My Cold, Undead Hand’! 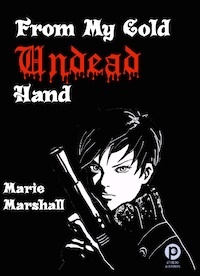 Nikki Mason from BestChickLit.com is the first reviewer of Marie Marshall’s teen-vampire novel From My Cold, Undead Hand. The review is to be found in the site’s ‘Young Adult’ section. Nikki describes it as “a great adventure book”, and we can testify to that! You can read the review here. Categories: Agency | Tags: books, fiction, news, review, vampire, vampires, writing | Permalink. The passage is from the story-within-a-story, a translation of a rediscovered, nineteenth-century manuscript said to be the writings of a female vampire-hunter. You will find it embedded in Marie Marshall’s futuristic teen-vampire novel From My Cold, Undead Hand, which now has its own feature page at P’kaboo publishers. Just click the book cover to be taken there. There are extras – text and an audio file from the diary of one of the characters – for a limited number of purchasers. For those of you who would like a paperback version in advance of any domestic print launch, you can get it at Amazon – same goes for a Kindle version. The author, along with cover illustrator Millie Ho, are offering a couple of wallpapers using the cover artwork. They are available here. We at the agency are getting very excited about the publication of this teen-vampire novel! As with all titles from P’kaboo Publishers in South Africa, the publisher is keen to find ‘partner’ publishing houses in the UK, the USA, and worldwide who would like to make this novel available to a wider readership. Please contact this agency for further details. Categories: Agency | Tags: art, author, books, fantasy, fiction, macabre, news, novel, publishing, vampire, vampires, wallpaper, writing | Permalink.